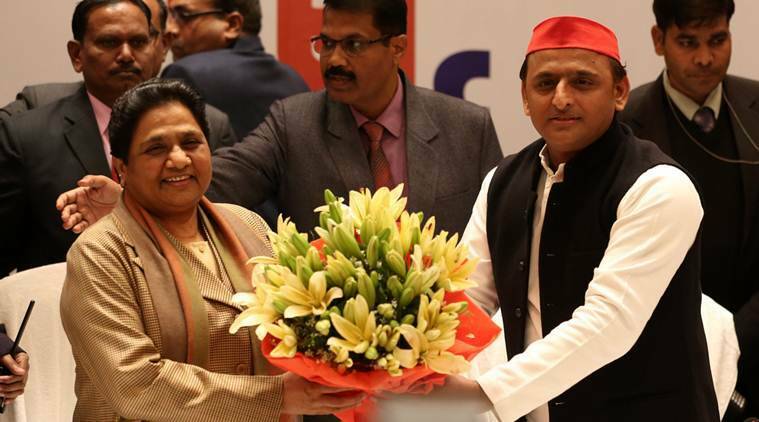 The alliance between the SP and BSP in Uttar Pradesh — long in the works and announced formally Saturday — has the potential to change the outcome of the Lok Sabha elections in the state. 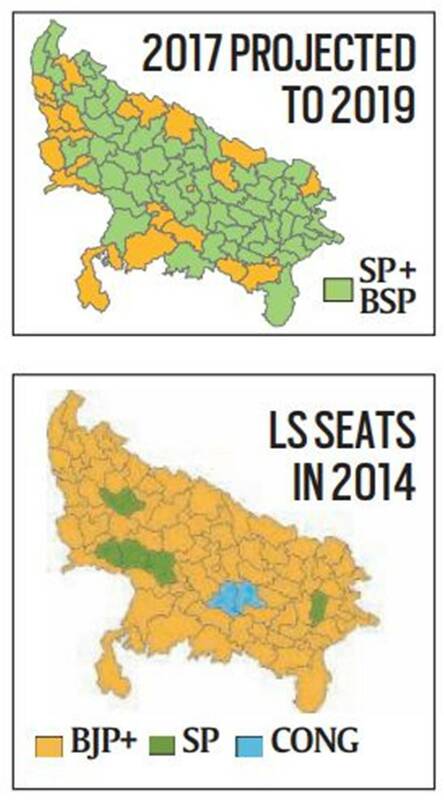 From almost entirely saffron now, UP could turn predominantly red-green-blue, the colours of the SP and BSP flags. An analysis of constituency-wise data from the 2017 Assembly elections, the latest in the state, shows the NDA could lose as many as 50 of its 73 Lok Sabha seats in UP if the votes obtained by the SP and BSP are combined. The SP-BSP alliance could win at least 57 of the 80 Lok Sabha seats, and the NDA (assuming the Apna Dal and Suheldev Bharatiya Samaj Party stay on with the BJP) could be reduced to only 23 seats. The SP and BSP contested both the 2014 Lok Sabha election and the 2017 Assembly election separately. The SP won five seats in 2014 and the BSP got zero; in 2017, the SP won 47 and BSP 19 in the 403-member House. In 2017, the SP was in an alliance with the Congress, which won seven seats. The BJP and its allies Apna Dal and SBSP, swept the polls, winning 325 Assembly seats. Since the SP and Congress had an alliance in 2017, votes polled by the Congress have been considered as SP votes in constituencies where the SP did not contest. Because the two parties also had friendly contests at some seats, the votes of the SP have been considered for these projections. It is important to note, however, that these projections are based on data 2017, which may not necessarily hold entirely in 2019. This is because no two elections are the same, and the personal popularity of Prime Minister Narendra Modi is likely to be an important factor in the Lok Sabha elections. Also, notwithstanding Akhilesh Yadav’s call to cadres to respect Mayawati the way they would respect him, the workers of the SP and BSP have been old political rivals — and whether the electoral arithmetic is translated into actual victories on the ground will depend heavily on their chemistry and the transfer of each other’s votes.